The title 'osteopath' is protected by law (Protection of title) and you have to be registered with the General Osteopathic Council (GOsC) to practise in the UK, Isle of Man and Gibraltar. It is a criminal offence, liable to prosecution, for anyone to claim explicitly or by implication to be any kind of osteopath unless they are on the GOsC Register. In order to be registered, you must have completed a course of training that is recognised by the GOsC. Training courses generally lead to a bachelor’s degree in osteopathy (a BSc Hons, BOst or BOstMed) or a masters degree (MOst). Courses usually consist of four years of full-time training, five years part-time or a mixture of full or part-time. 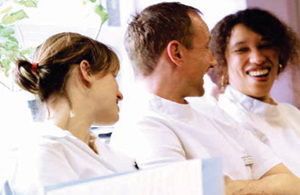 There are also courses with accelerated pathways for doctors and physiotherapists. A degree course includes anatomy, physiology, pathology, pharmacology, nutrition and biomechanics, plus at least 1,000 hours of clinical training. Read more here about the 9 UK institutions currently accredited to provide osteopathic training. The Osteopathic Foundation, and individual training institutions may be able to provide information about sources of funding for course fees and maintenance. If you have any feedback or concerns in relation to osteopathic education or the courses we recognise please contact the Professional Standards Department on standards@osteopathy.org.uk or 020 7357 6655 x240. We will treat all contacts with the strictest confidence. A practising osteopath must be covered by professional indemnity insurance for a minimum of £5 million, to ensure that a patient harmed by treatment can be adequately compensated. As an osteopath you may work with children and/or vulnerable adults so, as part of your registration, you are required to have an enhanced check for regulated activity which is performed by the Government agency the Disclosure and Barring Service (DBS). There may be occasions when a UK osteopath graduate could have their registration application reconsidered on the grounds of conduct or health. Our statement on the relationship between recognised qualifications and registration outlines the limited circumstances in which this might happen. We set up a Student Fitness to Practise Working Group to look at related issues, including the need for further guidance to students on professionalism, fitness to practise and their obligation to ensure patient and public protection. As a result, draft guidance was drawn up and consulted on. In 2012 we published the final guidance for osteopathic students and osteopathic educational institutions about student fitness to practise and students with a disability or health impairment. Did you find the information you were looking for? Let us know at webfeedback@osteopathy.org.uk. Your feedback will help us to improve this website. The new CPD scheme started rolling out for existing osteopaths on 1 October 2018. New osteopathy graduates who register with the GOsC on or after 1 October 2018, will automatically be on the new scheme.